Last Sunday I headed up to China Camp State Park in Marin County. I had never been to China Camp before this visit. As I mentioned in an earlier post, China Camp is a beautiful spot on th western shores of San Francisco Bay. China Camp Village has some very interesting old buildings – and this wonderful, quirky, old pier that juts out into the bay. 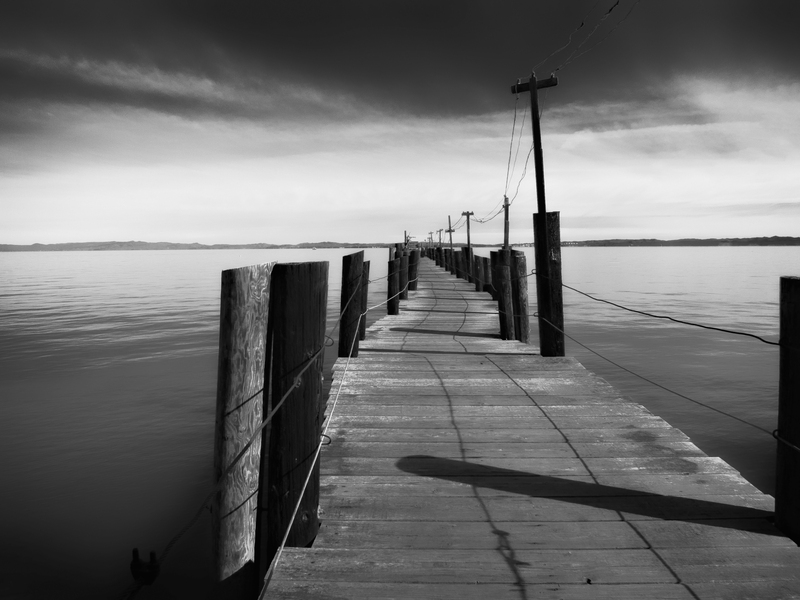 I shot a number of different images of this pier – from the left, from the right, and down the middle. I used two big DSLRs – my new Nikon D600, my old faithful Canon 5D Mark II, my iPhone 5, and the camera I used for this particular shot – my tiny Canon PowerShot S100. I continue to be delighted how many great “spur of the moment” shots I capture with this camera (and its earlier versions, the PowerShot S90 and PowerShot S95 – both of which I bought new and subsequently sold as I upgraded along the way). This was a RAW image shot with the S100, minimally adjusted in Lightroom 4.3 and then brought into Photoshop CS6. I went through my full sequence of steps to enhance the image in the Lab colorspace – before deciding that I thought I’d prefer the final result in monochrome. I used Nik’s Silver Efex Pro 2 to do the black and white conversion before bringing it back into Lightroom for a couple of final tweaks. This was a very satisfying image for me. Watching it evolve through the Lab color enhancement process was fun – and then the move into monochrome with Silver Efex was especially exciting. Hope you like it too!